A man lying facedown on the ground repeatedly shouts "I can't breathe, I cannot breathe" as police officers punch him and stomp on his back in New Kensington in a video widely shared Friday on Facebook. But Arnold and New Kensington police say the video clip shows only a small part of the incident in which, they say, suspect Justin Harvey, 40, of New Kensington allegedly refused to pull over for Arnold police, ran from them and pulled a .45 caliber handgun from his pants before he was pushed to the ground along Kenneth Avenue in New Kensington. Arrest papers said he tried to grab an officer's Taser or sidearm and, once on the ground, continued to resist putting his hands behind his back so he could be handcuffed. The Westmoreland County District Attorney's office is investigating the incident in which two officers were placed on administrative leave. Police have not released the names of the suspended officers. The local chapter of the NAACP plans to conduct its own investigation. "We want transparency," said Liney Glenn, president of Allegheny-Kiski Valley NAACP unit. The incident happened at a time of heightened concern about police brutality and excessive use of force. Tensions have boiled over in some cities across the country after several high-profile incidents involving police use of force and killings of unarmed black men. Several officers have been assassinated in revenge shootings. Police on Friday asked if anyone has additional video of the incident to contact the Westmoreland County District Attorney's office. The Facebook video, viewed Friday by more than 30,000 people, shows Harvey on his belly in a yard, surrounded by Arnold and New Kensington officers. It shows one officer apparently punching Harvey in the side as he resists being handcuffed and later another officer stomping on the man's back after he appears to be in handcuffs. After about 50 seconds, an officer picks Harvey up and grabs him in an apparent choke hold, taking him to a New Kensington police car that had pulled onto the street about 25 seconds into the video. The video ends after about two minutes, as Harvey is pushed into the back of the car after hitting his head on the trunk. New Kensington police Chief James Klein said his department "does not condone misconduct by officers" but stressed that there is more to the incident that what is shown in the the video. "Police are citizens and have due process rights like anybody else," he said. Westmoreland County District Attorney John Peck said he had not seen the video and will not look at it until after detectives investigate and come to a conclusion. He confirmed that police chiefs from New Kensington and Arnold contacted his office to request an investigation. "The chief of police in New Kensington and the chief in Arnold asked me that the DA's office investigate this case, or review this case for possible criminal prosecution, and we are going to do that," he said. One Arnold patrolman and one New Kensington patrolman are on administrative leave pending the investigation. Arnold Solicitor David A. Regoli issued a statement confirming the investigation into allegations of use of excessive force. "The City of Arnold is not making a judgment one way or the other on the allegations and want to ensure the public that it does not condone, sanction or endorse the use of excessive force by members of their police department." The incident began during a traffic stop on 14th Street in Arnold just after 11 a.m., according to police reports, when Harvey jumped out of a red Chevrolet Impala and ran. Officers said they chased Harvey along Proctor Alley and caught him in the 1200 block of Kenneth Avenue in New Kensington, about three-quarters of a mile from where the chase started. District Judge Frank J. Pallone Jr. arraigned Harvey on closed-circuit TV at the New Kensington police station and said he did so because of a safety issue. The judge said he couldn't allow the media or a large number of the public into the usually public arraignment because he didn't have anyone to check people for weapons. Outside the courtroom, at least 40 members of the Harvey family, friends and community advocates waited in a parking lot. "Police need to apologize and rectify," said Chanda Moyes of New Kensington, a concerned citizen and block watch member. She said the violence appears to involve "power, not race" and that police "lost control." Harvey relative Donielle Owen Diggs, also of New Kensington, said police "need to do a house cleaning." Officers are "trained to protect the public" and "this is not what you would expect" from them. Harvey is charged with having a stolen gun, attempting to disarm an officer, resisting arrest, carrying a concealed weapon without a license, fleeing or attempting to elude police, having marijuana and drug paraphernalia, and reckless and careless driving. Pallone ordered Harvey held in the Westmoreland County Jail in lieu of $75,000 cash bond pending a Feb. 2 preliminary hearing. Harvey's attorney, Todd Hollis, referred to his client's bond amount as "ridiculous" and asked Pallone to reduce it. Pallone refused, saying Harvey has a considerable arrest record, is accused of having a stolen handgun and tried to get away from police, even fighting with them. Area clergy, residents and family gathered briefly Friday evening to protest the police treatment of Harvey. About 60 people stopped throughout the evening by the sidewalk and parking lot near Pallone's office. A small group gathered when Harvey was transported from the police station on a gurney to a local hospital. Harvey, who is recovering from hernia surgery, requested to go to a local hospital for examination, according to his aunt, Dara Price of Arnold. Price said of the police handling of her nephew, "I want those officers fired or extensive training, some form of punishment." The group was shocked and saddened by what they characterized as police brutality occurring in the small city where police and community cooperation is fostered. They were particularly upset that the incident occurred just two months after the NAACP and Westmoreland County Community College presented a forum on how to prevent racial strife and improve relations with police. Local clergy were upset and called for justice. "We don't want them to mistreat our children," said Pastor Ronald White of Canaan Outreach Ministry in New Kensington. Pastor Lovie Scott of the World Overcomers Ministry in New Kensington described the incident as "excessive force." "Those who represent the law are supposed to be the first to obey the law," Scott said. Pastor Teralyn Bossio of the Joseph's Coat Community Outreach in Arnold called the incident an abomination. "These people are supposed to be leaders of the law," she said. Two Westmoreland County police officers are being investigated after a cell phone video appears to show them punching and stomping on a suspect after a chase and arrest last week. The officers, one from New Kensington and one from Arnold, have not been named and police will not comment. But both have been placed on leave pending the outcome of an investigation by the district attorney's office in Westmoreland County. District Attorney John Peck said through a spokesperson Tuesday that the office will have no comment beyond the fact that it is investigating the incident. Several officers fought with Justin Harvey, 40, of New Kensington on Thursday after they say he fled a traffic stop and admitted to them that he had been smoking marijuana. Police said he initially drove away from the stop, led police on a chase, bailed out and ran, pulled a gun and resisted arrest once he was cornered and taken to the ground. Mr. Harvey's lawyer, Todd Hollis, said several officers used excessive force in taking him into custody, shocking him with a Taser and then kicking and stomping on him after he was handcuffed on the ground. "My client at one point is heard saying 'I'm not resisting,'" Mr. Hollis said. "He says 'I can't breathe.' One cop can be heard saying 'good.'" Mr. Hollis said two women at the scene recorded parts of the incident with their cell phones. One video posted on Facebook appears to show an officer punching Mr. Harvey in the side while he is on the ground. A second officer is seen a few seconds later stomping on his back after he appears to be in handcuffs. An officer then grabs Mr. Harvey in what looks to be a choke-hold and walks him to a police car. Mr. Hollis said he will not comment on the actions that led to the chase and the scuffle, including whether his client pulled a gun as police allege or resisted arrest as they say he did. An affidavit supporting Mr. Harvey’s arrest identifies the arresting officer as Wesley Biricocchi, son of Arnold’s mayor. The other Arnold officer identified is Joshua Stanga. The New Kensington officers who assisted are not named. Officer Biricocchi said he pulled Mr. Harvey’s car over after he saw it swerve into the wrong side of 16th Street and nearly hit the sidewalk. When he talked to Mr. Harvey, he said he smelled marijuana and said Mr. Harvey admitted smoking it. When Officer Biricocchi said he would search the car for pot, he said Mr. Harvey indicated he had “more than a little” marijuana. The officer then ordered him out, but he said Mr. Harvey started the car and started driving away. A chase began involving several police units and ended on Proctor Alley, where Mr. Harvey stopped the car and took off on foot. Officer Biricocchi said as Mr. Harvey ran, he pulled a handgun. When Officer Biricocchi drew his own gun and ordered Mr. Harvey to drop his, he said Mr. Harvey threw the weapon over a fence. Officer Biricocchi said Mr. Harvey stopped but refused to lie down as ordered at gunpoint, so the officer took him to the ground. He said he and Officer Stanga tried to arrest Mr. Harvey but that he continued to fight with them while on the ground and tried to tuck his arms under his body so they could not handcuff him. Officer Stanga then shocked Mr. Harvey with his Taser, but Mr. Harvey grabbed it and tried to take it from him, according to the affidavit, causing it to come into contact with both officers. Officer Biricocchi said officers struck Mr. Harvey in the ribs to get him to release the Taser. Officer Biricocchi said he then lifted Mr. Harvey from the ground and walked him to his patrol car, but said even then Mr. Harvey continued to resist until placed in the car. The handgun was later found to have been stolen in Ford City. Mr. Hollis said the alleged actions of his client before he was subdued don’t matter. If police abuse a suspect after he is in custody, as he said the video shows, it constitutes a violation of his civil rights. He said Mr. Harvey was treated at a hospital for a collapsed lung, burn marks from Tasers, head trauma and leg trauma. He said he is preparing a federal suit against the officers. 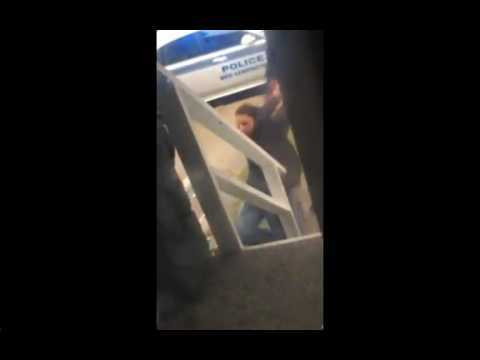 New cell phone video has surfaced in a case already under investigation in New Kensington. New Kensington Police Chief James Kline promised the department will be as transparent as possible as they look into whether two officers used excessive force in an arrest. Some new video appears to show the New Kensington police chief witnessing some of the alleged brutality. The suspect’s attorney, Todd Hollis, shared the new video with KDKA. He is calling into question what, if anything, the chief did or did not do if he was present at the scene. The new video shows crime suspect Justin Harvey in handcuffs being brought over to the New Kensington Police cruiser in what appears to be a choke hold. The video also appears to show Harvey being slammed against the cruiser. As he is waiting to be placed inside, Hollis claims you can see the New Kensington police chief walking toward the officers who are handling his client. “If you’re there and you saw it, you know what happened. You have a duty, an obligation to report it,” said Hollis. The video appears to show one of the officers punch Harvey while the chief is standing nearby. “That’s tacit admission. Or if it’s not tacit admissions, those are rogue police officers who obviously aren’t concerned about being censored by their chief. Either way, it’s a problem,” said Hollis. When KDKA spoke with Chief Kline after the first video surfaced, he called it “disturbing” and said it did not show the entire confrontation. Chief Kline also promised the investigation into one of his officers and another from Arnold would be as transparent as possible. “This is not just simply about Mr. Harvey. It’s also about the other citizens that are in contact with police officers who believe that they don’t have to respect one’s civil rights. They do,” said Hollis. Harvey, who is 40 years old, is accused of receiving stolen property, fleeing and eluding police, trying to disarm an officer, carrying a firearm without a license, resisting arrest and other charges. “If Mr. Harvey committed a crime, then Mr. Harvey is going to face a jury or a judge and they’ll make the appropriate adjudication. It doesn’t happen in the streets of New Kensington,” said Hollis. KDKA left a message requesting an interview with the chief and have not heard back. The District Attorney is not issuing any comment at this time, as the case is still under investigation.